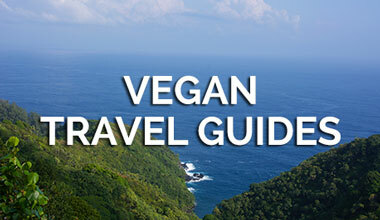 HELLO Happy Friendly Vegan Travelers!! As I’m writing, it is July 13th, 2016 and I’m starting to get REALLY hungry right now. Even more hungry after seeing Upton’s Breakroom post on Facebook it’s their 10 year anniversary this week, and all week long they’re giving away envelope prizes with each purchase of $15 or more. Mmmm now that sounds like a decent treat to myself since I am in the area of Upton’s, and today actually marks exactly 10 months I’ve been vegan. So, a little back story as to how I ended up a vegan, and how I arrived here outside of Upton’s Breakroom in Chicago, about to indulge in a Jackfruit Sandwich for my very first time! On Sept 13th, 2015 my life changed forever, and completely unexpectedly. Last year I worked at LUSH Cosmetics. LUSH specializes in fresh handmade 100% vegetarian and 80% vegan products. Last year I also went through a bit of a health battle due to a very poor birth control method (I’ll never ever take birth control again). My health was failing me, and I’m too young for that, damn it! So I started to be proactive. First I went vegetarian because LUSH as a company inspired me to do so and it was also something that I had never ever tried before. Sure enough, after the very first week of trying it I felt SO amazing! September came along and I was still a very happy, content, and only sometimes unhealthy feeling vegetarian. One day, Liz Hartnett, my coworker at LUSH, came into the back room at work while I was on my break. 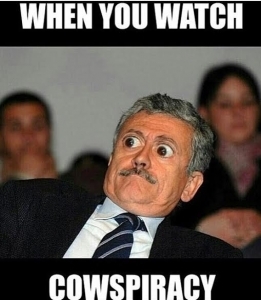 Liz, always full of light and energy, explained to me how I MUST watch this new documentary on Netflix since I’m a devoted vegetarian. She explained how a couple of her LUSH friends actually contributed to the making of the film so I MUST rate it with 5 stars so it can stay on Netflix because there are some meanies out there trying to get it pulled. 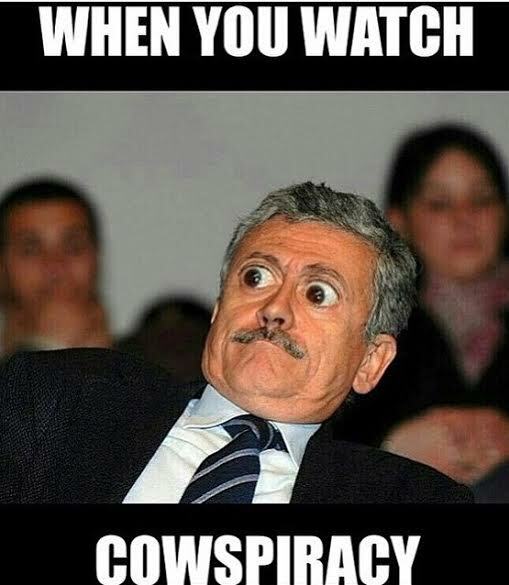 The documentary was Cowspiracy. And like I said, my life was changed forever. 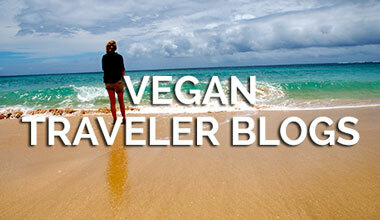 I went vegan COLD TURKEY. Absolutely no more animal products in my body. Absolutely NOT. It was extremely challenging, to say the least. Not only what I was already battling with my health, but then came the extreme acne and the extreme bathroom breaks. My stomach and skin were on the fritz getting all of the toxins out of my body from the last 25 years of consuming animal products. It made me extremely self-conscious and an outsider to my own body. Yet I knew there was no going back for me. 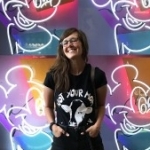 I didn’t have many vegan friends at the time, but I did have a few that stood strong in their beliefs and reassured me on the phone that I was absolutely doing the right thing and that my body will readjust once the detox is done. Particularly, my good friend Nicky who was living in San Diego, CA was a HUGE help on the phone. I had known her since I was 5 and she became a vegetarian by the age of 10. She was vegan by 21. With plenty experience under her belt, let’s just say I called her just about every time I went to Whole Foods for the first couple of weeks. I hope this proves to be an inspiration to anyone else just starting off on their path to veganism. 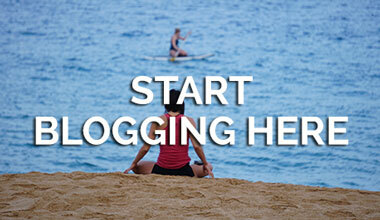 It can be quite isolating at first, but I promise it absolutely gets better! And just as any vegan will say, “my only regret with veganism is that I didn’t do it sooner.” Feel free to reach out and shoot me a message anytime to say Hi or ask me any questions you might have. I love chatting with new vegans… because with only 10 months under my belt, I definitely am a new vegan as well! 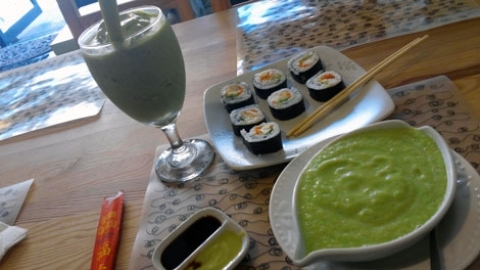 Upton’s Naturals is vegan owned, independently owned, and has been around for 10 years and going strong. Their restaurant, Upton’s Breakroom (2054 W Grand), has been around for 3 years and their products (jackfruit, hamburgers, seitan, etc.) are sold in stores nationwide! Upton’s most popular item is their jackfruit. SO similar to pulled pork it’s insane. I understand not all vegans like faux meat or even the idea of it. I do not mind it at all. In fact, during this visit to Upton’s I finally had my very first taste of this famous jackfruit. Upton’s is also SUPER popular for their soft serve vegan ice cream. 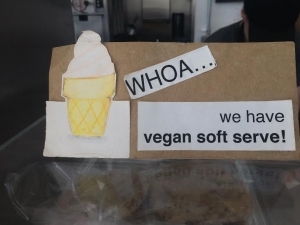 I mean how often can one stumble across a vegan ice cream cone? It’s rather rare. In Chicago, there are only 3 restaurants in the entire city that offer this option. 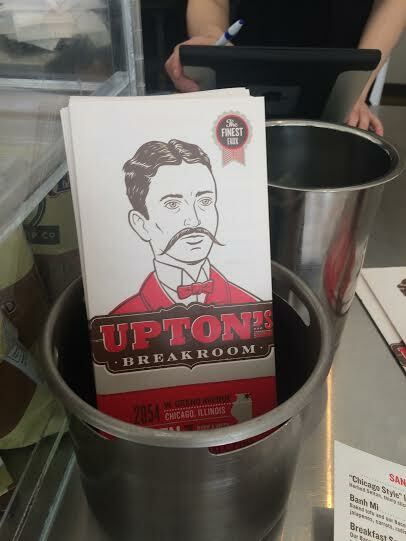 Upton’s is my favorite choice of the 3 by far, and they always mix up their soft serve flavors, which is fun. They even had a cucumber flavor recently! I indulged in strawberry ???? Why is this my favorite vegan spot in Chi? The staff is friendly and the food is to die and be reborn for ???????? Before I became vegan I had a pretty lousy diet overall. I ate pretty much anything I wanted. No restrictions. If I was hungry I was HUNGRY. So Upton’s holds that “comfort food” factor for me through and through. Hamburgers.. Nachos.. Soft serve ice cream.. What more can a single gal ask for?! ???? WHAT I ORDERED: It’s a beautiful, sunny day in a quiet neighborhood of Chi. Upton’s Breakroom has four tables indoors, and four outdoors. It’s super quaint, but I’ve never ONCE experienced a long wait to get food. Never more than 10 mins no matter what day. 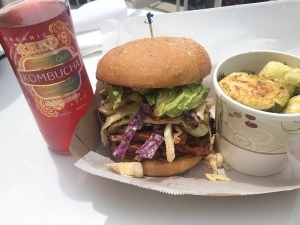 On this sunny day: BBQ Jackfruit Sandwich with a side of Brussel Sprouts and Reed’s Kombucha for $20. 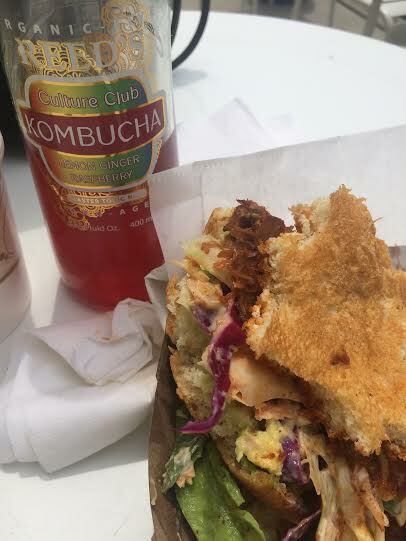 Yummm~ my first time trying a Jackfruit Sandwich! But NOT my first time trying Kombucha. Major yum. mmm the flavor of the day is Strawberry! Hope you get a chance to check out Upton’s Breakroom the next time you’re in Chicago!